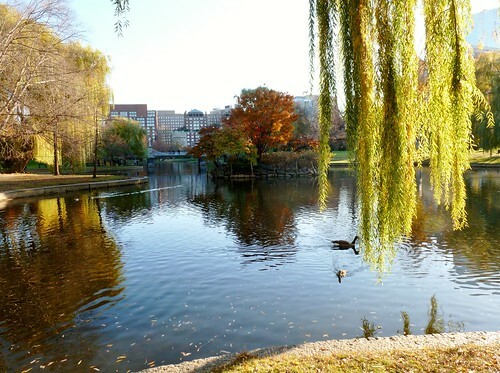 Today J and I took the T into Boston, where we had lunch at Quincy Market then walked the Greenway to Chinatown, through Chinatown to Boston Common and the Public Garden, then through the Public Garden and down Newbury Street to Mass Ave, where we caught the T for home. It was good to be out walking on a gray and warm day. Nearly all the snow has melted, so the earth looks bare and barren–just muddy, as if the landscape were under construction, caught between seasons. Plenty of people were out, Boston living up to its reputation as a pedestrian city. One of these days, we’ll keep track of the various languages we hear on a typical trip downtown and back: today we heard Spanish several times and Chinese at least once. At Haymarket, we walked through the weekly farmers’ market, with stalls selling produce and fresh fish arranged under long tents. Not all the food for sale is local: there were bags of out-of-state oranges piled into pyramids next to flattened skids of emptied cardboard boxes. Whether from near or far, the food was hawked by farmers, fishermen, and wholesalers who seemed eager to haggle. Yes, you could buy similar fruit, fish, or vegetables at your neighborhood grocery store, but would you have an actual conversation with your grocer before heading for home? In Chinatown, there were red paper lanterns hanging from utility wires in advance of next weekend’s Chinese New Year’s celebration along with even more open-air merchants selling fruit and firecrackers out of trucks and car trunks. 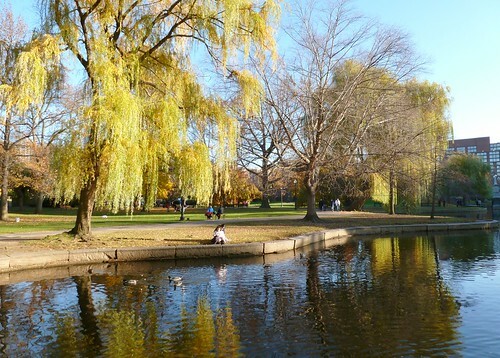 Everywhere, people were walking and trying to do business: merchants in Haymarket and Chinatown, panhandlers outside of T stations, and buskers in the Public Garden. 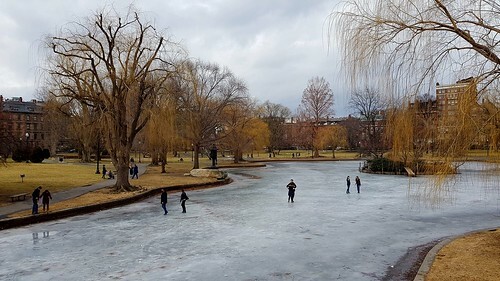 At City Hall, there were families skating on a rink leftover from Christmas; at the Public Garden, small throngs of twenty-somethings were out on the ice, walking where the Swan Boats and ducks float in summer time. The ice was porous with puddles–I wouldn’t have trusted it–but more enticing than the chance to walk on water was the promise of the yellowing willows that fringe the lagoon. 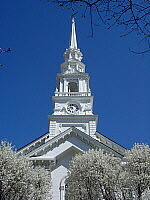 If the willows are brimming with yellowing buds, spring can’t be far behind. I spent most of today inside, either teaching classes or grading papers between classes. Tonight as I tried to decide what to blog today, I started browsing my Flickr archive to see what I photographed this time last year. 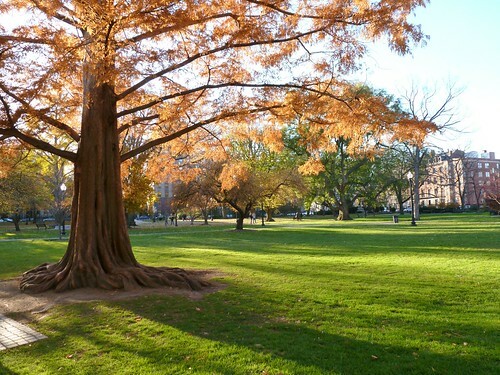 Last November 22 was Thanksgiving Day, and J and I took a walk around Boston’s Back Bay. 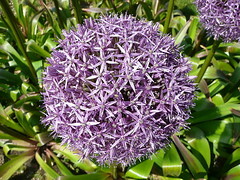 It was a brilliantly sunny day: the kind of day when nearly everything looks lovely. I took (and posted) over 60 photos last Thanksgiving Day, but I ended up blogging only a few of them: it was one of those semesters when I didn’t have much time to write. 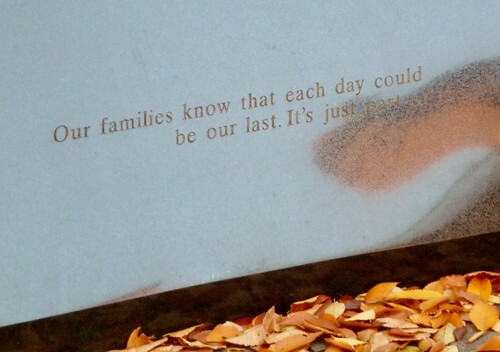 One of the things I photographed during last year’s Thanksgiving Day walk was the Vendome Fire Memorial on the Commonwealth Mall, not far from the site of the Hotel Vendome Fire, which killed nine firefighters in 1972. 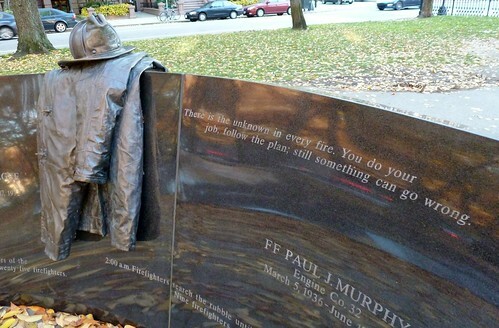 At the time, I planned to blog the memorial, but I never got around to it, which seems a bit ironic now. 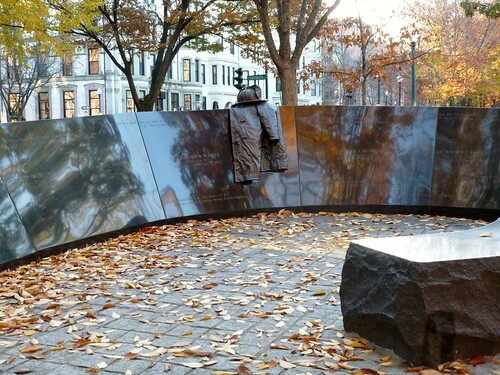 What is sadder than not finding the time to remember nine men taken in the prime of life? As much as I would have liked to have spent more time outside today, I’m almost grateful to have been reminded of last year’s Thanksgiving Day walk and the pictures I took then. It’s never too late to remember something you never meant to forget. 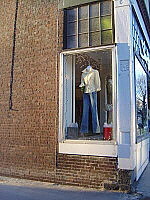 This is my Day 21 contribution to NaBloPoMo, or National Blog Posting Month, a commitment to post every day during the month of November: thirty days, thirty posts. 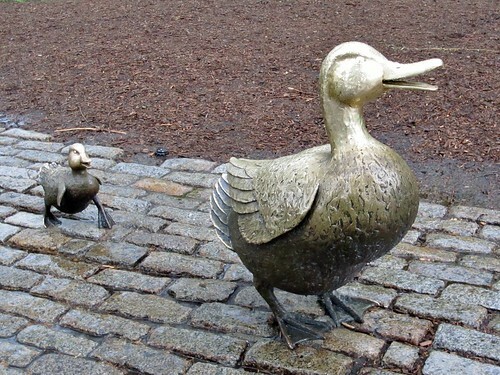 If you ever want to photograph Boston’s “Make Way for Ducklings” statue without throngs of children perched and posing on mama duck and her brood, just walk through the Public Garden on a rainy evening, when you’ll have the place almost entirely to yourself. 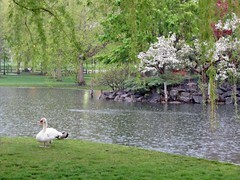 On Saturday night, J and I took a rainy stroll through the Public Garden on our way to a symphony concert, just as we did last year. 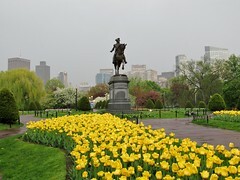 Whereas last year, the Public Garden was full of tulip-appreciators of all shapes and sizes, on Saturday night, the rain kept all but the most diehard park visitors away, including a couple in wedding finery who stayed huddled in their limosine rather than venturing outside for a spring-green photo-shoot. 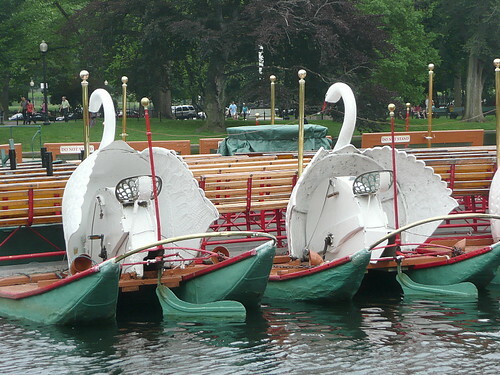 Although it was too wet for swan-boats, the Public Garden’s resident mute swans were undeterred by rain, one of the pair standing sentry at their usual nest-site. 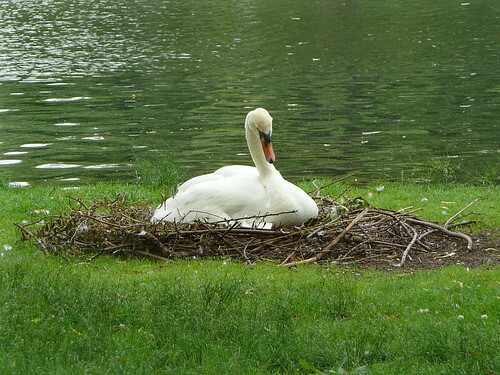 It won’t be long until this sentry will be sitting on a stick nest while her mate runs off any intruding ducks. 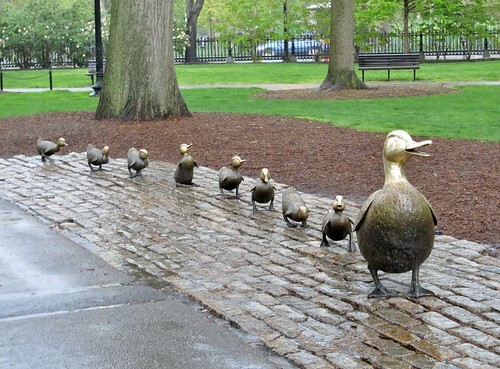 Until then, a rainy Saturday night is a quiet time in the garden, the weather perfect for waterfowl of all kinds. 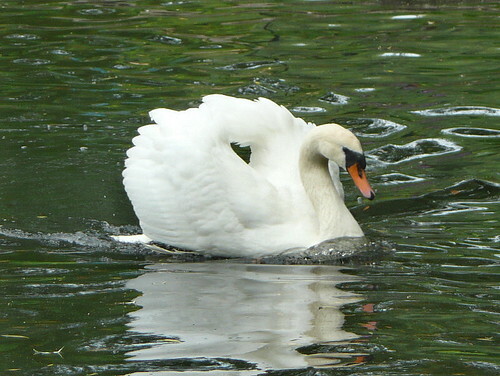 Unfortunately, this curved-neck, raised-wing posture isn’t a placid pose; instead, it’s a threat display called “busking.” A swan swimming with curved neck and raised wings is trying to look big and menacing as it chases other birds from its territory, and swans (like geese) are particularly aggressive when it comes to defending their territories. 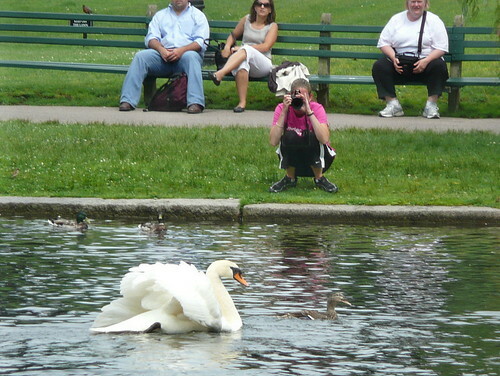 On Sunday in Boston, the “other bird” this swan was chasing out of its territory was a female mallard who swam the entire length of the duckpond trying to escape the angry swan on her tail. 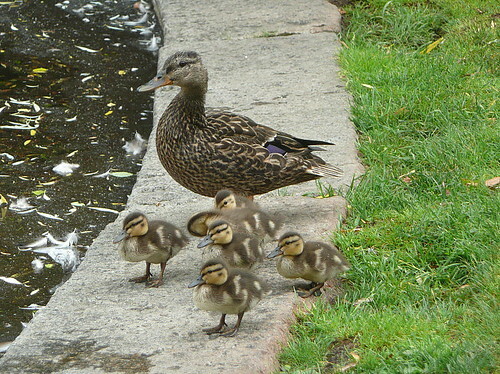 …but that female mallard had her own reasons for feeling protective. After hurrying her ducklings onto shore, the female mallard made one last quacking attack, flying directly at the swan and successfully chasing it toward another corner of the duckpond, where it continued to busk and bully other waterfowl. Perhaps this pond is big enough for both of them. Given the number of tulips I photograph every spring, you’d probably never guess that as a child, tulips were my least-favorite flower. Tulips always struck me as being boring and non-imaginative, the kind of flower you’d design if your tastes were monochromatic and you had no flair for texture. I’m guessing the tulips of my childhood were particularly bland, their uniformity as unimpressive as that of artificial flowers. Or maybe I just didn’t like Tiny Tim. 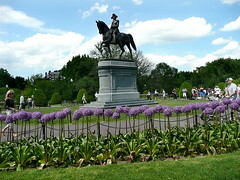 On Saturday around sunset, J and I took a quick walk through the Boston Public Garden on our way to an evening symphony concert. 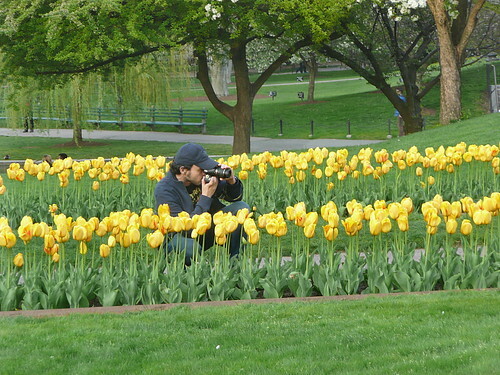 The Public Garden tulips were in full-flower, and with them were throngs of tulip appreciators, many of them with cameras. 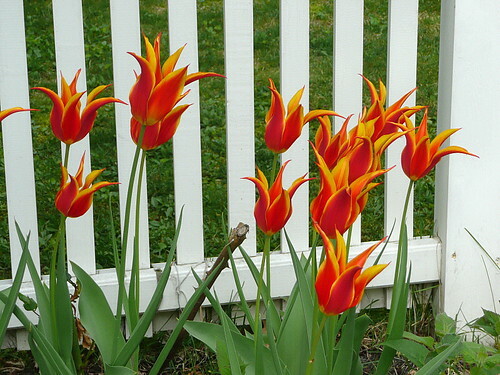 Perhaps my botanical tastes have matured, or maybe there are more (and more interesting) tulip varieties in New England gardens than there were in the Ohio gardens of my childhood, because now I find myself truly liking tulips. Whereas those bland tulips from my childhood seemed boring in their monotone uniformity, now I’m amazed at how many colors, shapes, and sizes tulips take. Or maybe I just really liked Michael Pollan’s The Botany of Desire and haven’t been able to look at tulips the same way since reading it. 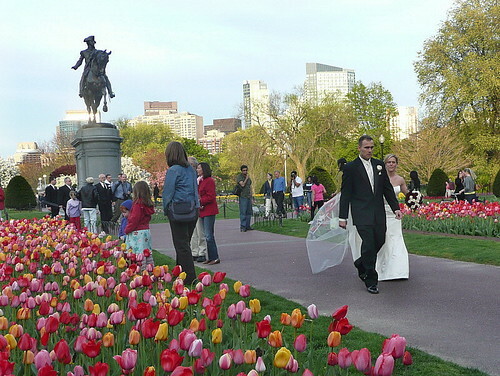 …as well as a bride and groom fresh from a wedding photography shoot among tulips, exactly four years and a day after the last time I blogged an April-chilled couple posing for pictures in the Public Garden. Maybe it’s not the tulips that are remarkably uniform, but the behavior of tulip-appreciators (myself included) year after year. 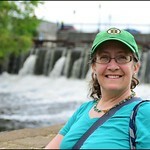 Click here for a photo-set from Saturday night’s quick walk through the Boston Public Garden. 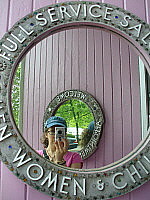 On the one hand, I snap pictures I think I might someday blog, my eye always looking for something new or noteworthy. On the other hand, there are certain things I can’t help but photograph even though I’ve already blogged and re-blogged them so many times, I no longer have anything new to say. What more can be said about the fresh, new leaves of spring, or how many more posts about flowers can I share? At this point, I’ve recognized that having a teeming archive of random photos is largely useless. Even if I, at some future date, decide I want to revisit the photo I took of Object X some Y months ago, there’s the question of whether I’ll ever find it: did I take that picture in January or March or May, and was it this year or last? Even when I can find a “vintage” photo, my Inner Ethicist has qualms about frequently posting pictures from the past. In my mind, Hoarded Ordinaries is a chronicle of Life Right Now, so if I post too many pictures from last week, last month, or last year, the sense of immediacy is lost. To me at least, frequently posting archival pictures feels like cheating. What I’m describing here is something of a personal conundrum. On the one hand, I insist on taking pictures without knowing exactly when or how I’ll use them, and I save these pictures rather than methodically tossing them. On the other hand, I’m hesitant to post archival images except in moments of blog-duress, when I’m desperate for something to share. If I were indeed hoarding canned goods, I’d be in the perilous predicament of saving up food I can’t by ethical precept actually eat, like a vegetarian stockpiling cans of beef stew. In such a scenario, how can you ever actually dig your way through your own accumulative impulses? Today has been a literal rainy day. This morning I took Reggie on an abbreviated (but nevertheless soggy) walk; since then, I’ve spent the day doing laundry and grading online papers. If I were to create a dated photo folder titled 2008-06-04, that folder would necessarily be empty since I took no pictures today. What better excuse to revisit a handful of otherwise useless images I snapped before meeting friends for Sunday’s Art Walk in Beacon Hill? 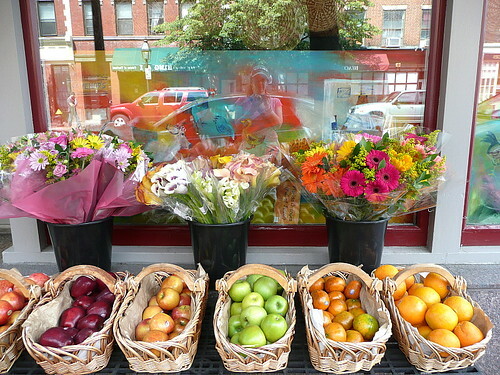 When else, exactly, will an occasion arise when I might need a photo of fruit and flowers outside Savenor’s, several shots of an equestrian statue of George Washington, and an extreme close-up of an allium? Ultimately (and perhaps paradoxically), I think what enchants me most about the photos I take is exactly this sense of utter uselessness. 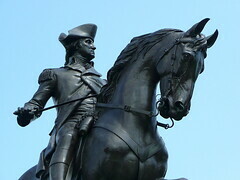 The world doesn’t need another photo of George Washington strutting on horseback through the Public Garden; the world will be in no way improved by another snapshot of fruit and flowers. But when has utility or sense ever governed creative pursuits? “O reason not the need,” Shakespeare exhorted in King Lear. “Our basest beggars / Are in the poorest thing superfluous.” Even on rainy days, we’re collectively blessed with more than we’ll ever want or need. If the Universe continually insists on presenting us with spring leaves, ripe fruit, eye-catching flowers, statues, and souls, why shouldn’t we continue to notice and savor them, stockpiling for imagined Apocalypses we can’t yet begin to fathom? The problem with getting married outside in New England in April is you never know what sort of weather surprise Mother Nature will throw at you. After a week of sunny days and summer-like temperatures, Saturday was brisk, cloudy, and threatening rain. 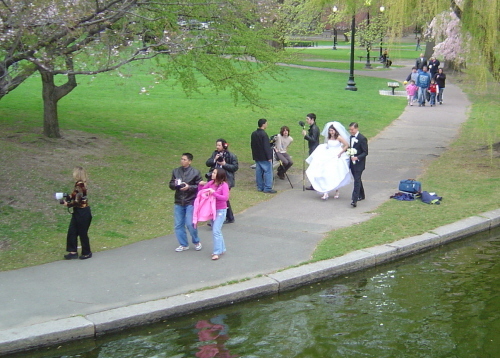 Like April brides who wouldn’t be daunted by mere weather, Leslee and I remained faithful to our plan for a Saturday day-trip to Boston where we browsed the galleries on Newbury Street and took a quick, chilly jaunt through the Public Garden. 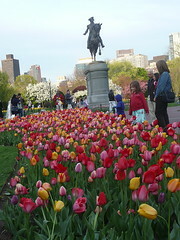 This time of year, the Public Garden is green and tulip-studded, perfect in pictures. 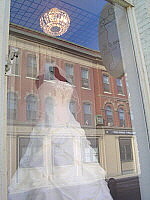 But if you’re a bride in a strapless dress on a 40-degree and overcast day, you’re blushing from cold, not modesty.